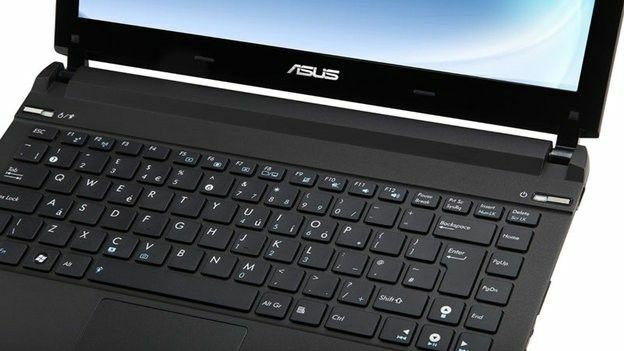 On the opposite end of the scale to the hulking Lamborghini VX7, the Asus U36J is a slim-and-light ultraportable machine aimed at regular travellers. It's one of the cheapest ultraportables we've seen recently, but the last-gen Intel Core processor means it also lacks the power of its competitors. The Asus U36J may not be blessed with the stunning looks of other ultraportables, such as the Samsung 9 Series, but it's well built for travel. The 1.8kg frame is slender and light enough to slip into your carry-on without hassle. It's also tough enough to survive a battering, despite the lid's narrow plastic hinges. Fingerprint scanners are becoming increasingly popular on business and ultraportable laptops, and you'll find one wedged between the U36J's mouse buttons. This can be used to secure your data against budding thieves, either instead of a password or as an extra layer of security. Despite the slender frame, you'll also find plenty of ports lining the edges. These include VGA and HDMI connections for hooking up monitors or televisions, as well as USB 3.0. Sadly there's no space for a built-in DVD drive, so movie lovers are limited to downloading or streaming films – or spending extra on an external drive. Thankfully the generous 500GB hard drive gives you plenty of space to load up with movies and music. A multi-card reader can be used to grab photos and other media straight off your phone or camera. If you're stuck on a plane next to a screaming rugrat, you'll be glad you packed this portable. Simply plug in some earphones and you can block out all annoying background noise with a loud action film. Movies look great on the vibrant 13.3-inch widescreen display, which is bright enough for prolonged use without doing your eyes in. Viewing angles are strong and the 1366 x 768 WXGA resolution keeps images crisp and clear. Unfortunately, you can't enjoy High Definition films on the U36J thanks to the basic integrated graphics. We tried to watch The Dark Knight in HD but it was a stuttering mess, and we quickly gave up and resorted to a standard definition version. This is bad news for gamers too, as you can only run older titles with anything approaching a playable framerate. If you can't survive without a regular Crysis 2 fix, you'll need to look elsewhere for your portable pal. However, the last-gen Intel Core i5 processor can handle almost everything else you throw at it. Applications start up immediately and you can multi-task to your heart's content, while the 4GB of onboard memory keeps everything running smoothly. Of course, the U36J can't compete in benchmarking tests with the likes of the Sony VAIO S-Series, which features current-gen Intel Sandy Bridge technology. Performance isn't as strong as we hoped, but the U36J comes at a good price considering how slim and light it is. We were impressed by the strong range of features, including plenty of storage space for your media collection.